The clamour for Theresa May’s departure is growing ever louder to all except herself. In typically obdurate fashion she marches blithely on down a slope that offers no semblance of optimism that she’s going to win anything this year. 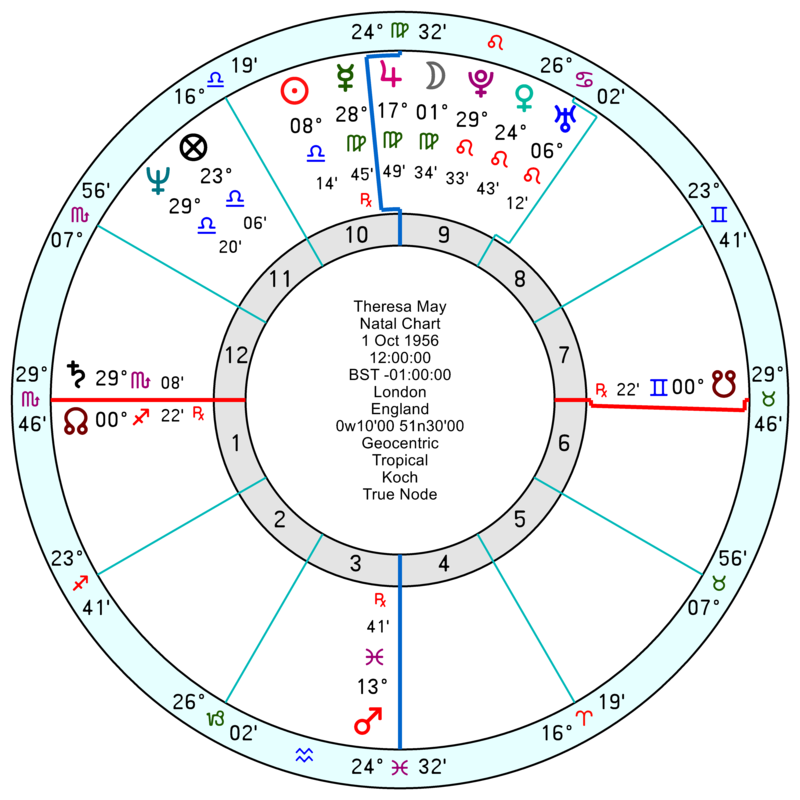 Tr Pluto squares her Jupiter/Saturn midpoint till the final week of May which is career loss-making; then she’s got the blocked, frustrating and irritating tr Pluto conjunct her Mars/Node till early July. 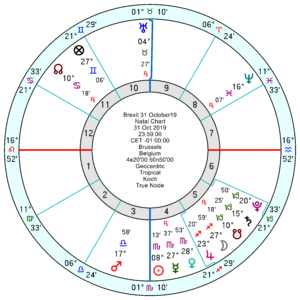 After which she picks up the catastrophic-setback tr Pluto conjunct her Mars/Saturn till late August and again November/December this year. 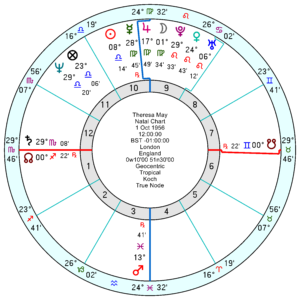 Tr Neptune is also sapping her motivation and undermining her power base in May to mid August as it opposes her Sun/Pluto midpoint at the same time as it has a dissolving action on her Government chart. 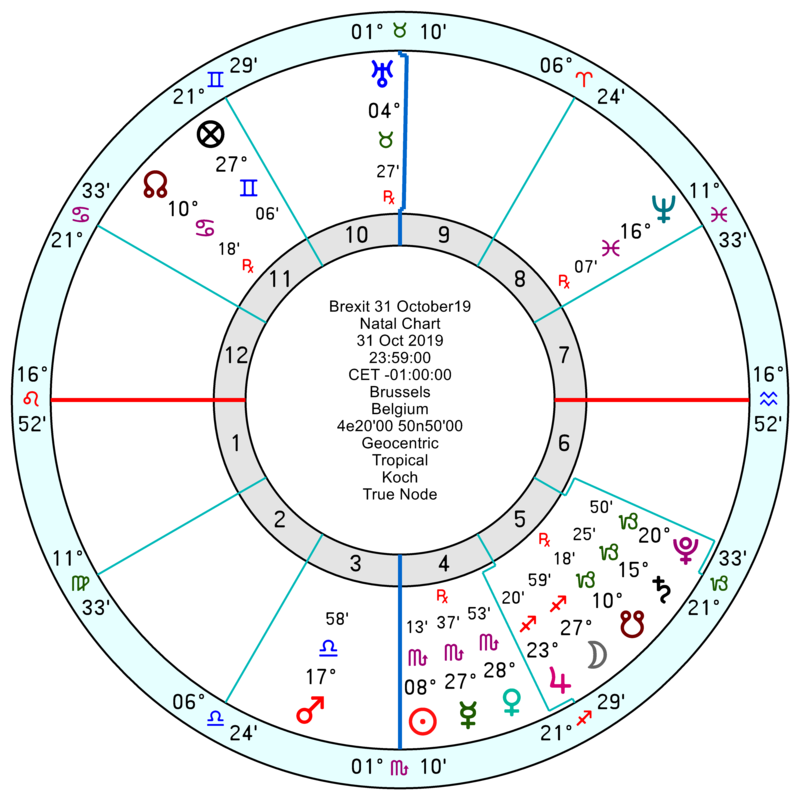 Mid August to late September tr Neptune is back opposing her Jupiter for dashed hopes; and into November, after the supposed deadline, she’s back in deep sh** with Pluto on her Mars/Saturn again. Late May to early June are the only two ripples of a suggestion that she might alter her status with the Tory Party and UK. But nothing too definite. I wonder whether the founding date/chart or the launching date/chart is the most important? The launch seems to have t square moon, sun, pluto, saturn with lots of sextile to mercury and venus. Is it better to have the MC in Capricorn or Pisces? The Guardian article linked to in the footnotes of the Wiki page states that the party was first registered with the Electoral Commission on 11 January 2019. I think the brexit party was formed some time ago…is there anything in that chart which intimates it’ll do well long term? The DUP’s confidence and supply agreement runs out in June and for their continued support they are going to insist on the Backstop being removed from the Withdrawal Agreement which the EU are point blank refusing to do. So I wonder if what you are picking up on the chart for late summer will be a general election. 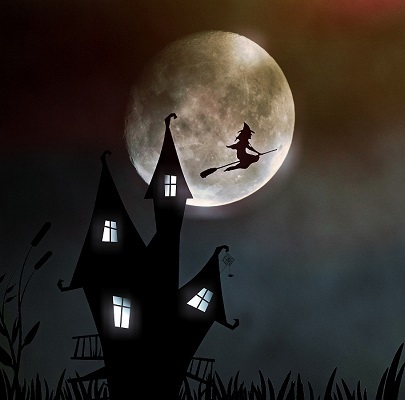 The late May/ early June ‘ripples’ for May might relate to pressure for her to go if the Euro election results are terrible for the Tories. In normal times, the leader would probably have to consider their position. However, these are not normal times and if she doesn’t want to go, I don’t think they can have another vote of confidence until December. yes be interesting to see a forecast for Farage’s and his new party. Not very astrological of me but Flippin’ ‘eck!